Dr. Sorenson provides comprehensive optometric care with an emphasis on diagnosis, treatment, and management of ocular disease in addition to pre and post-surgical care. She joined George R. Reiss MD PC in November of 2014. Dr. Sorenson is from Wisconsin and first came to the Valley in 1986. She received her Bachelor of Science degree from Kansas University and her Doctor of Optometry Degree from The University of Missouri. Dr. Sorenson completed her post-doctoral residency in low vision rehabilitation and hospital-based optometry at the Kansas City Department of Veterans Affairs Medical Center. 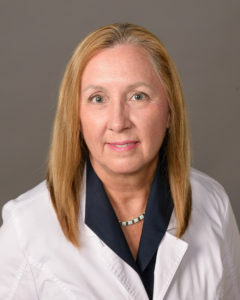 Dr. Sorenson served as the Assistant Dean of Clinical Education for the Arizona College of Optometry at Midwestern University and was on Faculty with Mayo Clinic Arizona Department of Ophthalmology for 15 years. She was also appointed by the Governor of Arizona to the Arizona State Board of Optometry in 2001 and served as its Vice-President and President. Dr. Sorenson also served as President of the Association of Regulatory Boards of Optometry from 2006-2008 and as President of the National Board of Examiners in Optometry 2009-2010. In addition, she was named Arizona Optometrist of the Year in 2006 by the Arizona Optometric Association. In her spare time, she enjoys bike riding, reading, horses, hiking, and kayaking. In addition, she is an author for Medscape and is currently working on a series of children’s novels. She looks forward to providing you with excellent care.